A deck full of Bijou philosophies. 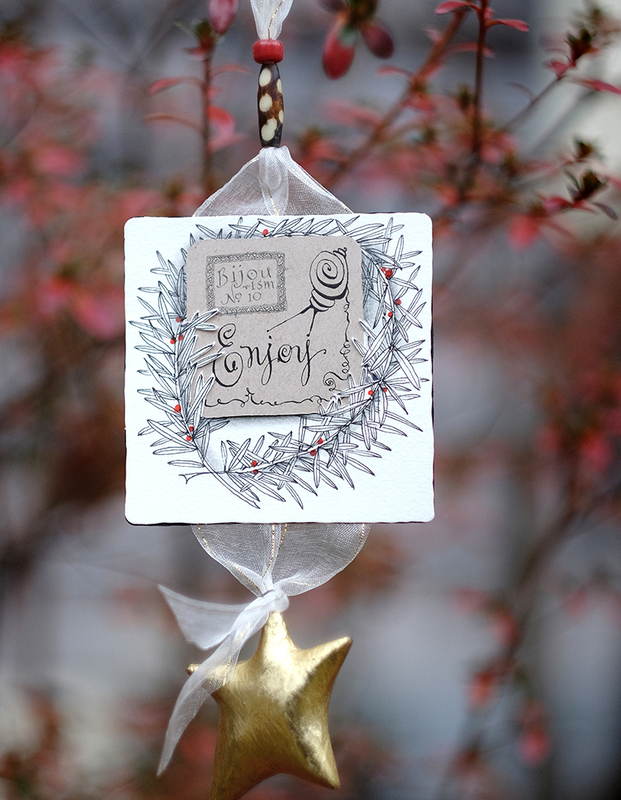 With passion and gratitude we bring our 2015 twelve-day series to a close. We trust that you all had a chance to enjoy each day as we challenged ourselves to create beautiful things using the Zentangle Method and with items we found around our home. 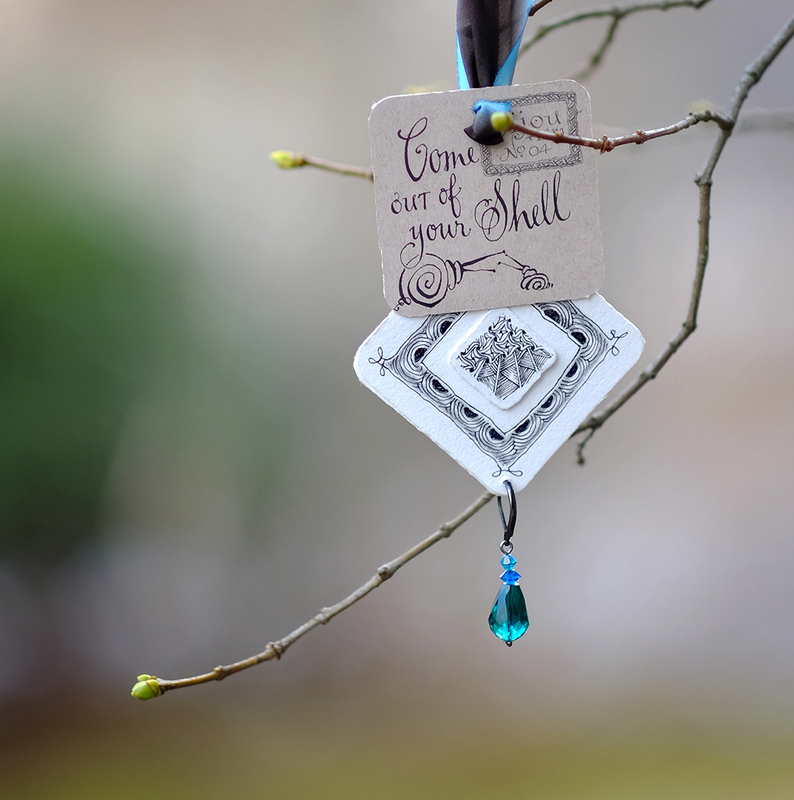 More importantly it gave us an opportunity to slow down, to breathe through our thoughts, and to focus on the hidden gems that Zentangle has allowed us to discover. We of course thank Bijou for coming out of his shell to share these zentiments with us. 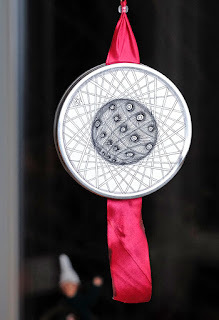 With confidence he has shown us how to admire and appreciate all of the deliberate strokes that we, as Zentangle artists, put down as we as speak in tangles and take comfort in a place where the string’s the thing. We can relax knowing we are all supported by a global community, where there are no mistakes, where you can always choose your tangles, and in the end leave yourself a moment or two to enjoy the shade. Bijou, and now Alfie, have shown us how to savor the little things as much as much as the big things. 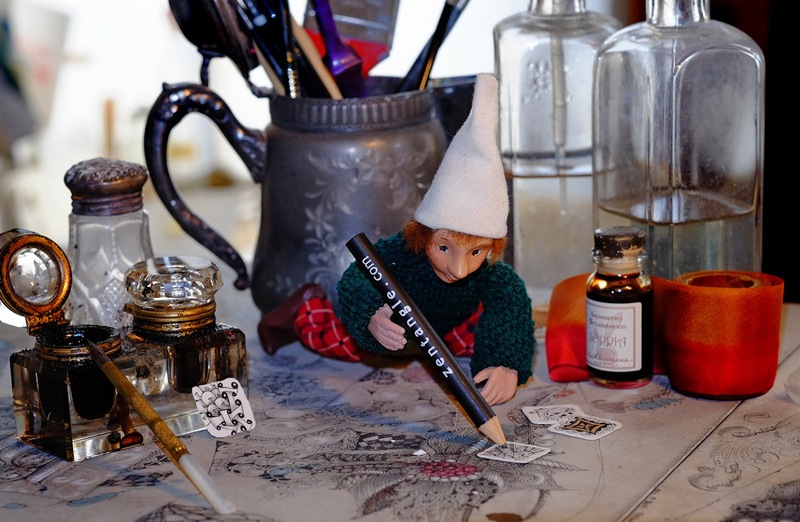 Trust your inner artist and spend some a moment or two during this busy time of year to embellish your own visions and to inspire others just as Alfie and Bijou have done for us. This has been such fun occasion to deconstruct our journey and to reflect on the memories that are beautiful and beyond. 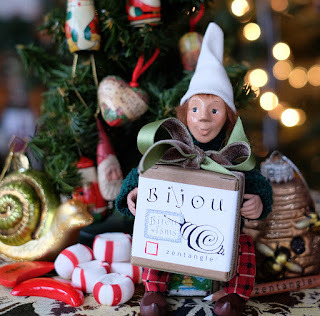 Alfie says, "Thank you Bijou, for Bijouisms 1-24!" Complete sets of Bijouisms are now available here. More info and ideas in this newsletter. Congratulations! Winners, please send your snail mail address to Zentangle (at) gmail (dot) com. Thanks again for all your wonderful comments over these past few days! All of us at Zentangle HQ! 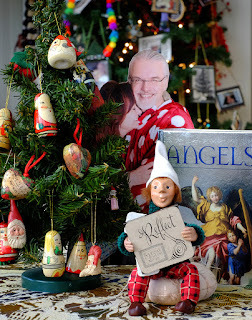 A reflection for my Christmas tree. Ahhhh . . . I love spending a moment here and there to look back at a time or experience that shaped me into who I am today. I didn't look up the definition of "reflect," but I always think of it as a pleasant action. I see it as a poignant way of thinking about those priceless moments that make up my past and my present. I appreciate how a fleeting sensory experience – a smell, a sound, a glimpse of an old toy – can trigger a memory and take me back in time to a deep moment of reflection. I have noticed that my Zentangle practice seems to enhance these moments of reflection. I also find that I often remember situations differently from what might have actually happened. What I find so great about reflecting is that I can choose which memories to focus on. I have learned so many things from my mother, but one thing I always admired was that she only seems to have room for the good memories in her brain. Ask her if I or my siblings ever did anything wrong as children and she'll say, "No, they really were perfect." She might be on to something! To be able to deliberately REFLECT (on) the good times, the accomplishments, and the beautiful people we were so lucky to know is an overlooked gift. Alfie is spending a moment looking back at the last ten days and appreciating how much fun he had learning about the Zentangle Method from his new friend, Bijou. He is so grateful for the gift of discovering a creative side he never knew he had. I wonder now if it was such a good idea to show Alfie how to use that two-sided tape . . . he's sticking stuff everywhere! I also think it's quite symbolic that Alfie taped his tiles to a mirror. Tiles that you tangle, like a mirror, also offer a reflection. We encourage you to take your tiles out from time to time and re-appreciate them, read the comments on the back, arrange and rearrange them in mosaics. Often, in such moments of reflection, I will notice something valuable that I didn't see when I first created the tile. The experience is like re-reading a journal entry, but it's a journal entry that isn't limited to the perspective I had when I first put my thoughts and feelings into those words. So, take a moment and look through your earlier tiles. Reflect . . . and appreciate! And while we are talking about reflection . . . we thought we would give you a chance to reflect on our original Twelve Days of Christmas ATC project from two years ago. For those of you who missed it, enjoy! For those of you that were following along, take another look, you may find comfort and joy in seeing things again with new (Zentangle) eyes. This LINK will get you started. Enjoy! Thanks again for all your wonderful comments! Just found this . . . not sure if you want to include it in the blog today. Actually not sure what it is from – it just appeared in my photos. Weird. Those synchronicities happen a lot around here. 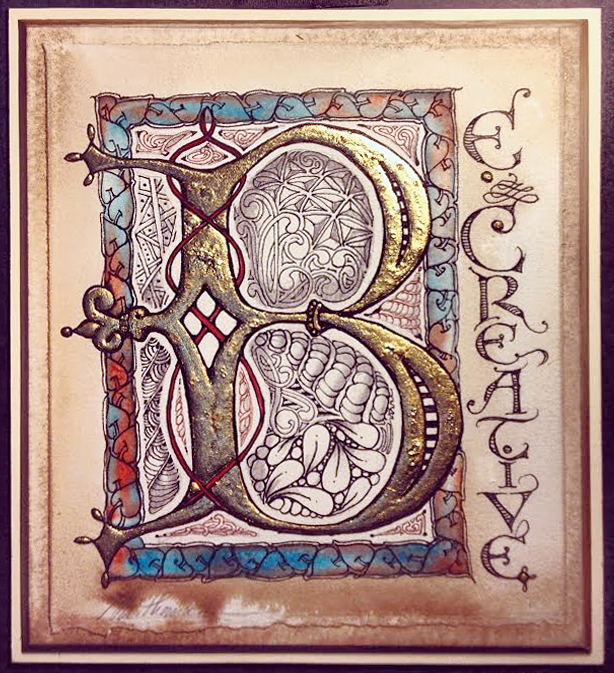 That "B" which Molly found is an illuminated letter (gold leaf) that Maria and I tangled as we gave a keynote speech at the Craft and Hobby Association convention in Anaheim, California, a couple years ago. Thanks, Molly! Maria and I recently traveled to Taiwan and Malaysia for a series of book-signings and lectures. The trip was beyond wonderful – full of amazing and beautiful people and beautiful patterns. It was a thrill and honor and we continue to bask in the memories. On our last day in Taipei, Taiwan, we got up early to get ready for our trip to the airport to come home. Wanting to savor every precious moment there, I walked across the street to the Shandao Temple a bit before 6AM. As I climbed the steps, I could hear the monks were already singing as the subtle incense greeted me. I was the only other person there. I sat down to absorb a few last minutes of that atmosphere. I watched my thoughts go to the topic of service. I thought about "service to others" vs. "service to self." But I was not comfortable with that dichotomy. Then the phrase, "service to creation" crossed my mind and I promptly reached into my pocket for pen and paper and wrote, "Serve creation by creating!" Ahh, I felt our trip was complete and I walked back to the hotel for our ride to the airport. To create is, by definition, in harmony with creation. Once creativity begins to flow, it feels as if all creation supports that event. As someone described, it's like "stepping into the slipstream of creation." "mamie p" wrote in the comments to yesterday's "Come out of your shell" post, "Sometimes the hardest part of coming out of my shell is making that first stroke . . . then the rest comes to take the final step of admiration and enjoyment." Thank you. That is so profound. Our invitation to all of you is to make that first stroke. One of the gifts of the Zentangle Method is that it sets up a comfortable "elegance of limits" within which you can do just that, without worry or self-criticism. And once you create that first beautiful mark, you're there . 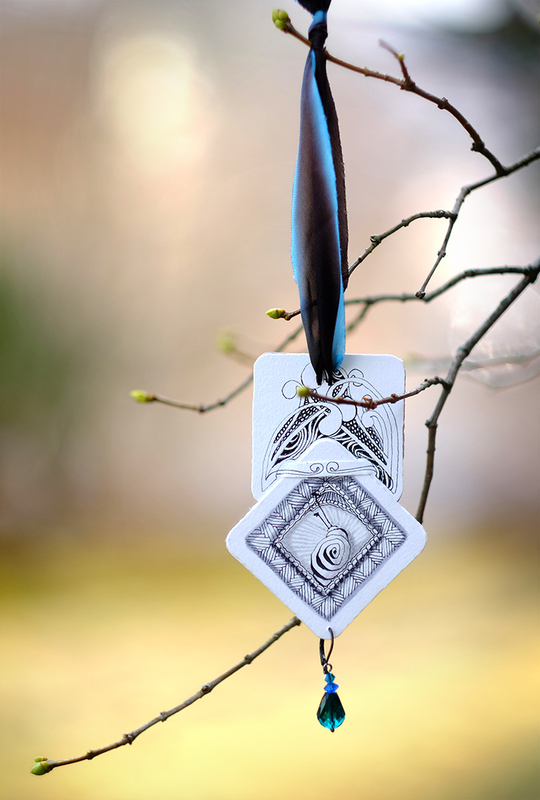 . . in that inspiring, gentle, resonant flow of creativity – of creation. And you realize that you can be there . . . whenever and wherever you want. I am a true believer in fate. In fact, fate inserts itself ​into my life so often, that I can't even tell anyone about it anymore lest they think I have fallen off my "twilight zone" rocker. Little things appear on a regular basis out of nowhere and just make my life ever so . . . interesting. When Molly came to me and said we were doing these Twelve Days of Bijou, I thought, "OMG, this is way too much work for this time of year!" But as usual, I listen to my children, like a dutiful child. And, I have always been glad I did. These ornaments are practically making themselves. We have not bought one special thing to do this project. All "stuff" we found around the house. Snippets of ribbons, string, tchotchkes, and trinkets – hiding out at the bottom of forgotten drawers and sewing baskets. Useless pieces of old jewelry and broken ornaments practically appeared as needed. This morning, I remembered a tin of broken tea cups I have been keeping, thinking that someday I would use them for "something." My Dad (an angel, for sure) had given me some fabulous old tea cups that belonged to his mom. They did not have much, so these were really valuable to me. One day, they broke – a long story, but I cried all day. Again, the concept of the "elegance of limits" came to mind. Like days gone by, people would make things out of other things. They had no craft stores to run to, no books on what to make with bits of rawhide or pottery shards. They saved everything because that's what they had to work with. And I believe those limited supplies inspired them do things they otherwise never would have – rag dolls, re-fashioned bicycles, clothing out of old clothing . 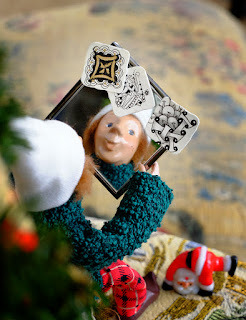 . .
Molly and I were determined to CREATE using found (albeit around the house) objects. And what better a found object than that piece of cup? Creativity was my best friend growing up. It never left my side. It would wake me in the night; cause my brain to explode in the middle of church. It also made me comfortable to be alone at times, even in a household bustling with numerous siblings, and later on, my kids. Creativity was the biggest gift in my lifetime. Was it handed down to me? Or was I just born this way? Aren't we all born this way? However you come to it or it comes to you, or when, Please, Please, don't let it get away. Don't let it fade. Hold onto it with all you got. This is our gift to you. It is your gift to yourself. Treasure it! If you don't believe you are capable of it, just pick up a piece of paper and start to tangle. There it is . . . see it? It's lovely. Really, just lovely. 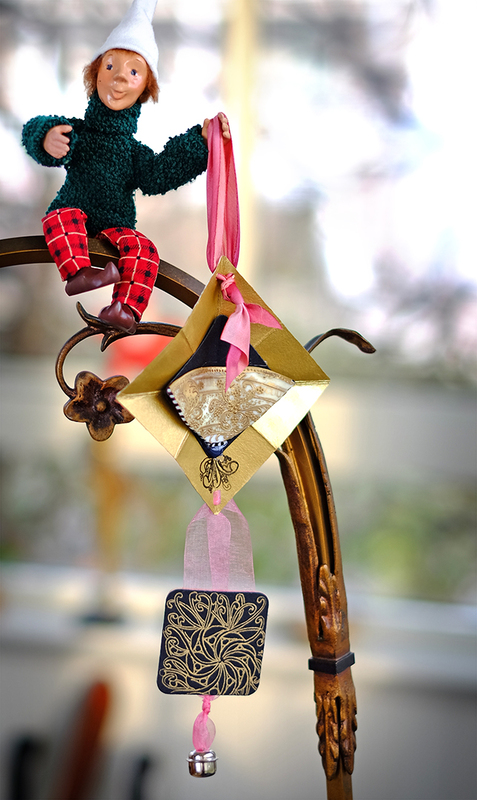 Bijou (and friend) created for me, a jewel for my Christmas tree! One of the things I have enjoyed most about being a Certified Zentangle Teacher is watching all the creative souls "come out of their shells." Bijou encourages us to do this of course and because it is something he, too, has had to learn. I love seeing someone create something beautiful that is completely unique and then recognize it as something wonderful. I love to watch each student's journey as they draw their strokes – one at a time – slowly and deliberately. I watch them escape into their own worlds with such focus. When they have put their final touches on that tile, I invite them to hold their tile at arm's length and admire their work. Then, I watch a smile appear on their face as they say, "I did that!" It is crazy and true that anyone can discover their artist within . . . you just have to give yourself a chance to "come out of your shell." Bijou's friend apparently did just that! 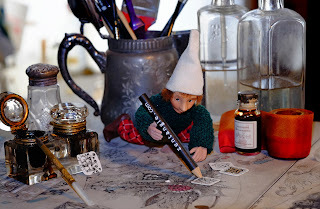 Inspired by all these blog posts, he found his way onto Maria's tangled blotter on her desk, grabbed some tools and tiles, and came out of his shell . 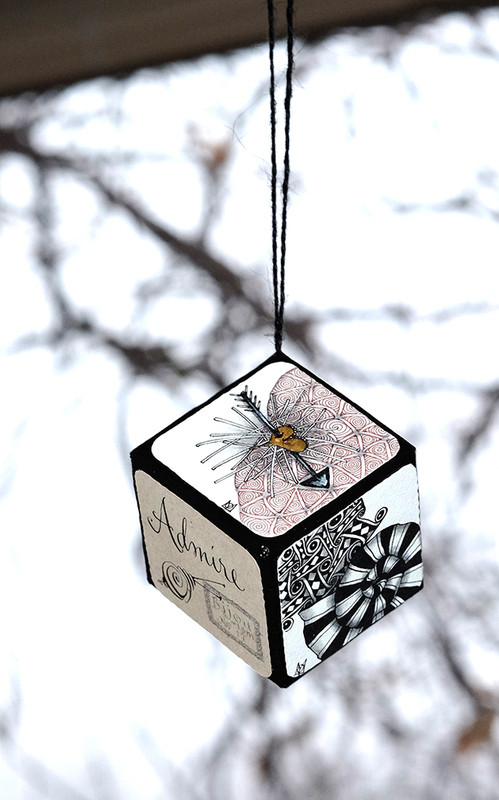 . . just in time to tangle a tiny tile for today's ornament. Many of you commented on our little buddy in the photos. "Alfie" was a gift from my sister Sue many years ago, way before the "Elf on the Shelf" thingy. I think he's kind of cute. 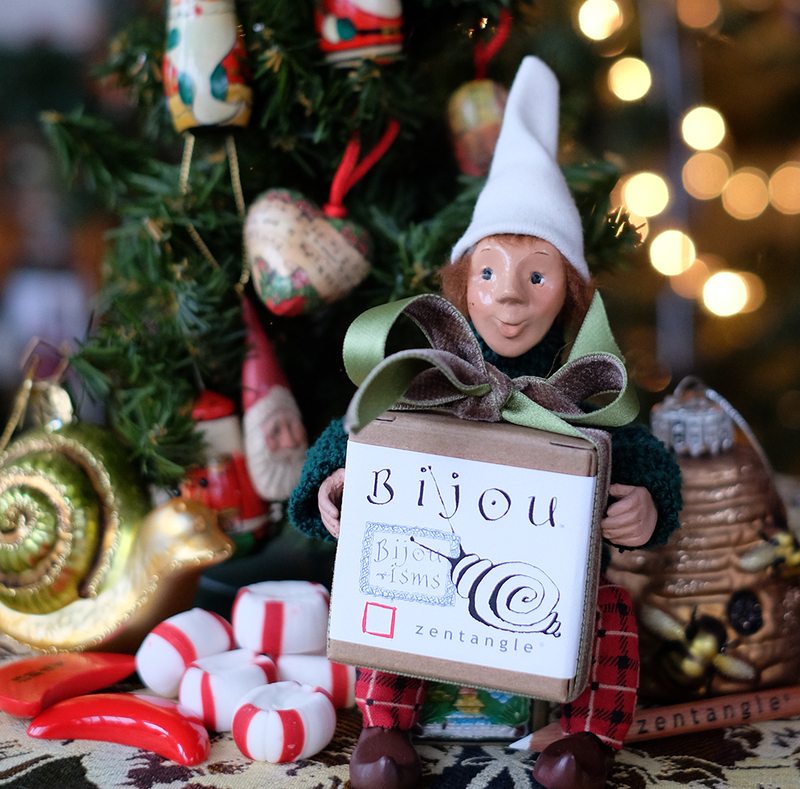 He's loving his role in these "12 Days of Bijou." The ornament du jour, is made from: 3 Bijou tiles, a Bijouism, a snippet of fine hand-dyed silk ribbon, and an orphaned earring. First, I cut two slits in the top tile with my trusty Exacto® knife. Then, I slid the second tile (the one with Bijou in the middle) into the slit and stuck another tile to the back of the bottom tile with double sided tape. Then I stuck a Bijouism to the back of the top tile and punched a hole on the top for the ribbon and another on the bottom for the earring. I tangled the tiles after I assembled them, But you could go either way. Oh yeah . . . I added Alfie's 3/4" tile (which Julie helped him with). 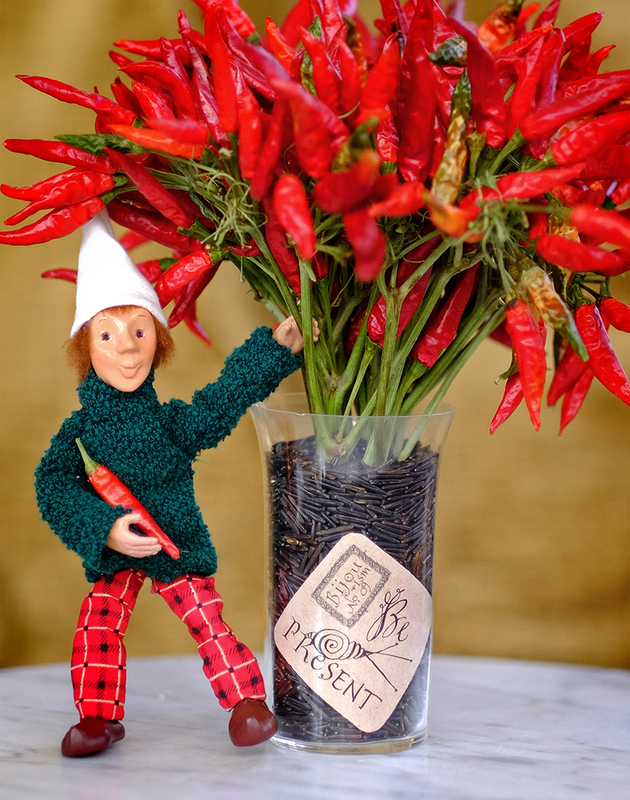 On the eighth day of Christmas, Bijou whispered to me . . .
. . . a suggestion to present be. I see it more and more – buttons, bags, signs, and apparel touting this message or something of the sort – "Be present" "Be in the moment" "Just be" – but what does that mean? I am present. I cannot possibly be the past or be the future? Can I? Of course not. But the truth is, our minds often wander to another place or time that is not in the present here and now. We hash over what has already happened, as if we can change it. We worry about what might happen next, as if we can predict it. 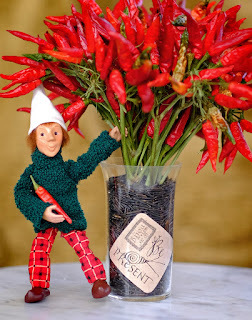 And, we miss what is happening at this red hot (chili pepper) moment. Nowadays, it's also too easy to spend so much time calling, texting, photographing, and posting an experience that we miss the actual experience. What if we could reset our clocks to the present time zone and fully participate in our journeys as we are experiencing them? 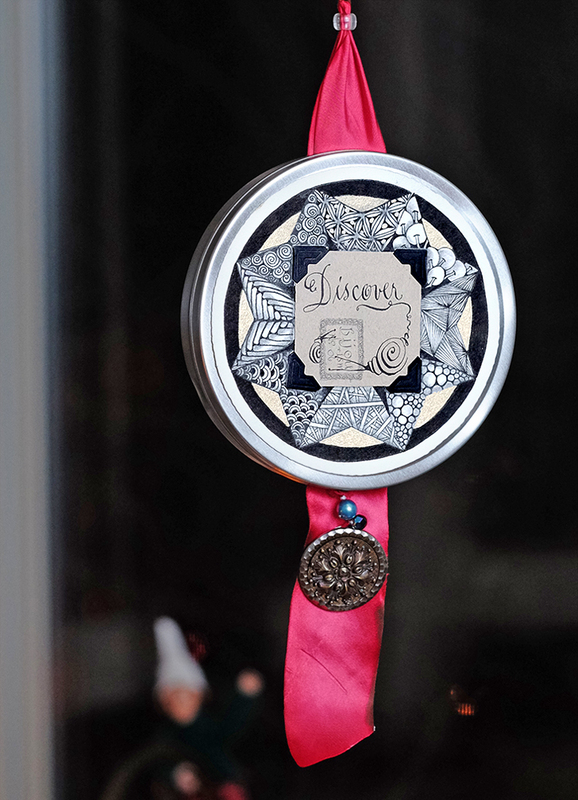 I have found that creating Zentangle art resets this clock for me. It slows me down as I focus on the one stroke at hand. I don't focus on the one I made before and I cannot predict how the next one will go. I certainly cannot do all three! If I tried, it would jeopardize the quality of it all. When I purely focus on the one stroke at hand, as if it is the only one there is, something beautiful happens. I then move on to the next with that same intention and in that way, I get more out of each moment. This has trickled into my life too. I find myself more aware of where I am and who I'm with. I'm also less likely to overbook myself which just results in my rushing to the next event, not able to enjoy where (and when) I am. Also, by not trying to capture every memory on a camera, I can enjoy the moment more. Now, I pocket my phone when I am with others. And whenever I discover that, once again, I've forgotten where when I am, I say to myself, "Time to do a little tangling to reset my clock!" Cheers to being present – now and everywhen! This is a fun project for sure. The trick is to find a glass or vase with fairly straight sides and not much pattern in the glass. Molly had this idea. She held the tiles while Julie poured in some wild rice. We're all having so much fun with this . . . thank you for all your wonderful comments! On the seventh day of Christmas, Bijou told to me . . .
in wreaths for my Christmas tree. I love to explore the uses and origins of words – particularly common words that we never think about any more than a fish thinks about water. What is behind the spells they cast and the sentences they pronounce? This word is based on the Late Latin (3rd to 6th centuries AD) confortare "to strengthen greatly," from com- (expressing intensive force) plus Latin fortis "strong." Sounds a lot like how we use the word "empower" today. Later, in the mid 17th century, the meaning shifted toward describing something producing physical ease. Then, we have . . . So, what's my take on all this? That over time "comfort" and "enjoy" shifted from actions one deliberately did, to experiences one passively received. I think that Bijou's choice of these two words is a suggestion to consider the original active, empowering meanings of these important words. Creating Zentangle art is active. You choose and make each stroke. You discover an ability to create. You also can discover an ability to deliberately take comfort and enjoy. O tidings of Comfort, Enjoy . . . 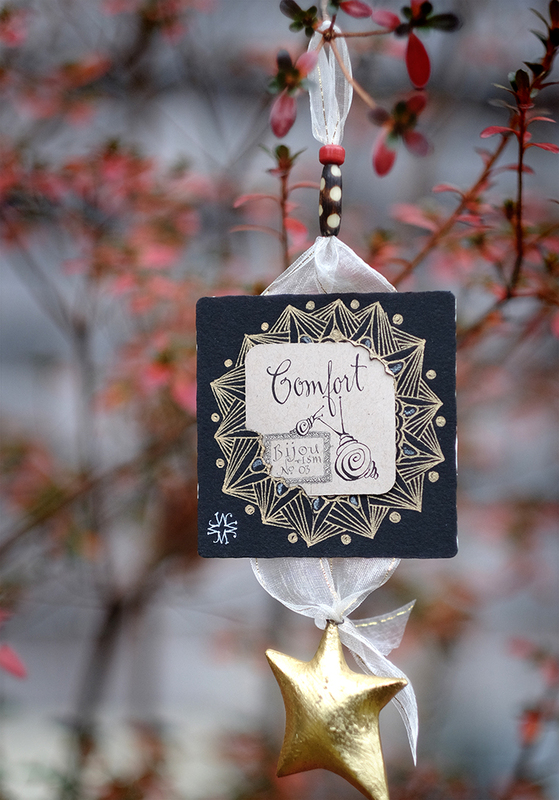 Comfort, Enjoy . . . in-deed! This ornament was brought to you by Martha and Molly. Molly carefully cut (with a nice sharp) Exacto® knife around a few leaves of Martha's verdigogh and some of my munchin – just enough to slide the Bijouisms into the tiles. Then she attached the tiles back to back with the ribbon in between with double-sided tape. The gold star was a piece of a wall-hanging the other half of which (a crescent moon) broke years ago. I really loved that thing, so the star stayed with us, wandering from place to place until it found its new home here. 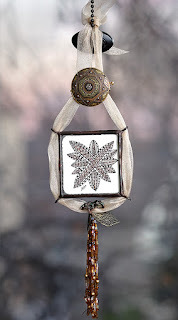 The bead is an African black bead with polka dots that I just love. I use them everywhere. I bought a few strings of them at an antique bazaar a few years back. 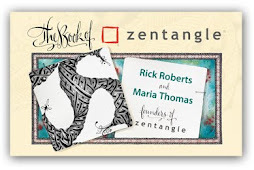 Congratulations and would you three please send your snail mail address to Zentangle (at) gmail (dot) com. Once again, many thanks for all your wonderful comments! 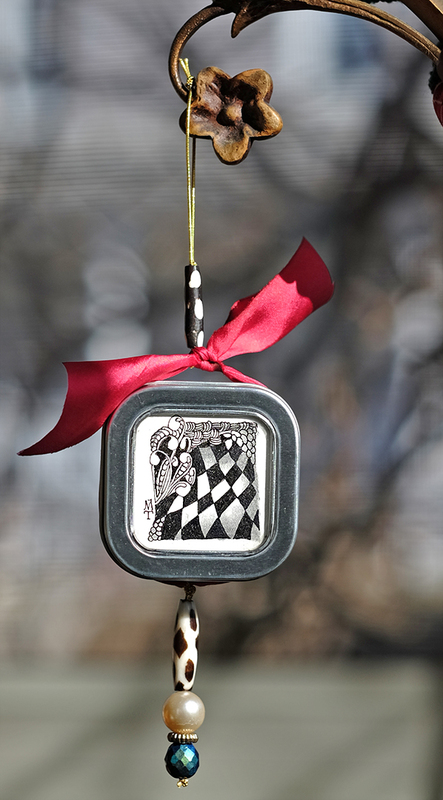 On the sixth day of Christmas, Bijou presented to me . . .
. . . a treasure for my Christmas tree. We all breathe. All ages, all cultures – with help or without – we all do it. It is a vital component of each moment of all of our daily lives. We all take in little bits of the air around us and then release it back into our environments and then do it over and over again. A simple breath can nurture and awaken the body and soul. It can bring perspective and awareness. However, in the rush and stress of life, our breaths can become short and almost forgotten. A slow deep breath can heal and bring focus – it can even give you strength. Sometimes a simple reminder to breathe isn't so much about just taking a breath, but rather to bring a little focus to how we are breathing. With that awareness, our breath rate slows down a tad. We allow each breath to completely fill our being and then ever so slowly release it all. It is a gentle reminder to, "Stop and smell the roses," and to see and appreciate where we are. When I first started tangling, I often found myself holding my breath and gripping my pen as if it were about to flee. As I continued my practice, I became aware of this and made it a priority to remind myself to stop every now and then and take a deep breath. Then, I began incorporating more focus into my breathing as I drew. It took a while, but I finally noticed my grip more relaxed. I found myself taking my time and enjoying each stroke – stopping here or there to regroup and then begin again. 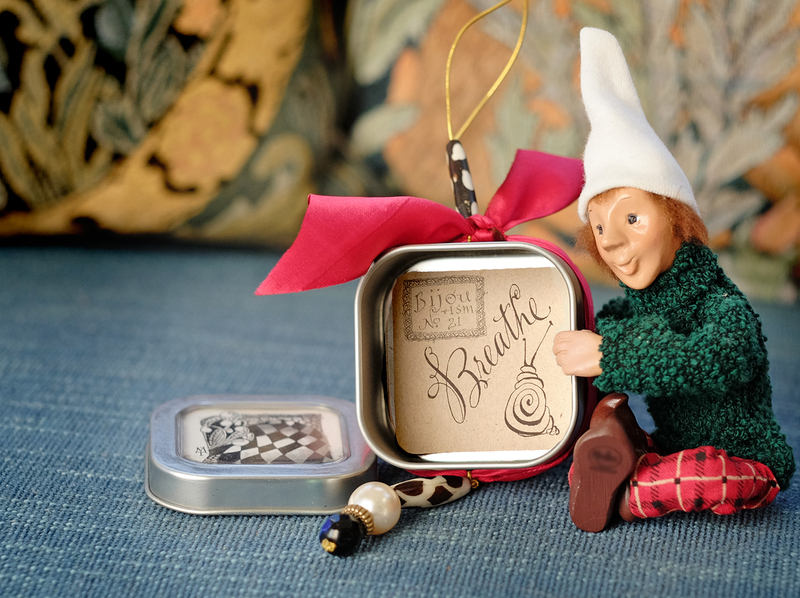 Breathing is such a wonderful tool, one that we all have with us to use and to guide us through our journey. 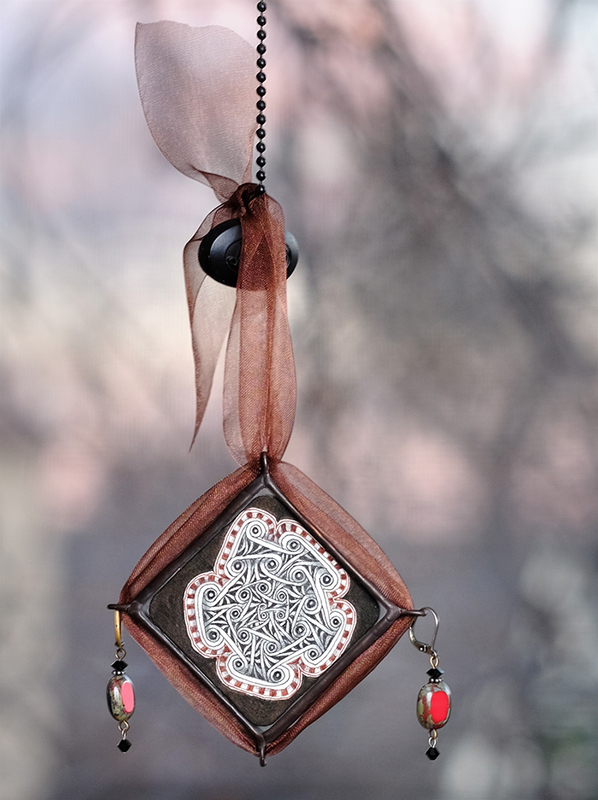 Maria created today's treasure with beads and baubles, ribbon and string, two tangled Bijou tiles, a Bijousim, a Bijou tin, and her ever-present double sided tape! Above winners, please send us your snail mail address to Zentangle [at] gmail [dot] com. Many thanks for all your wonderful comments! On the fifth day of Christmas Bijou toasted me . . .
. . . with a gift box for my Christmas tree. "Discover" generally means to find out something that you did not previously know . . . about the world, about yourself, or about what is possible. 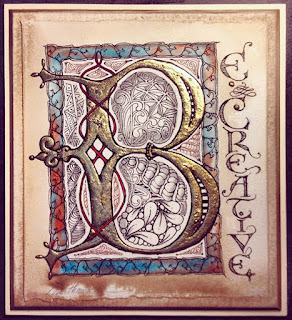 In Zentangle-speak, we often think of "discover" in terms of the artwork you create. By creating something new (compared with copying or coloring in something already there) you can discover something new and fresh at the end of the process – something that never existed before. That's one reason we don't pre-plan Zentangle art. How else can you enjoy the surprise and delight of discovery if you already know what you're about to find? 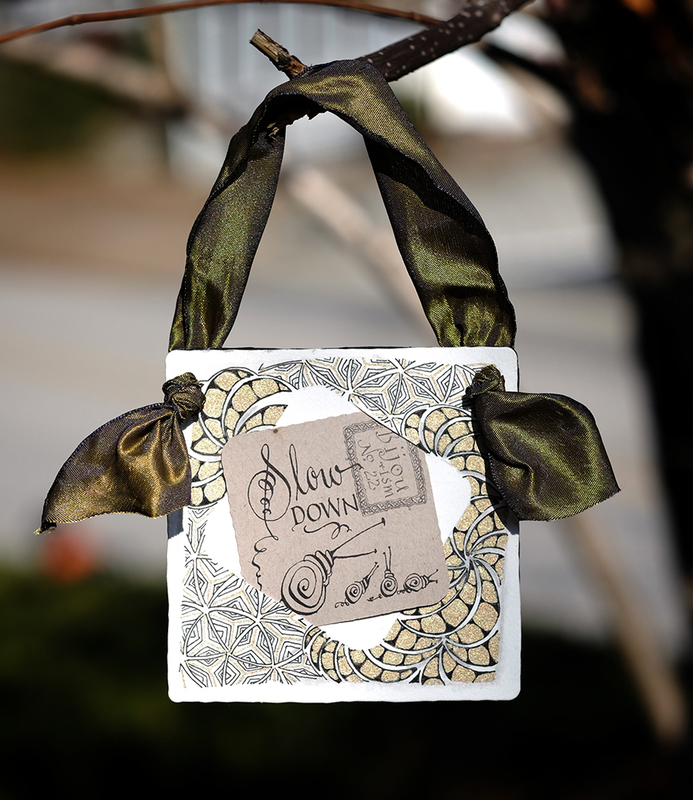 This "gift box" is made with​ two tangled Zendala™tiles and the tin that they came in. The front cover art, by Molly, has a Bijouism attached to it with photo corners. The tiles are attached to the tin with double-sided tape. 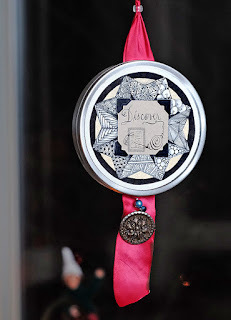 I sewed an old button to the ribbon, attached it with double-sided tape to the inside of the tin and then attached the cover. Add some beads and doodads, charms or mini ornaments. Then fill it with surprises, cookies, candies or jewelry. 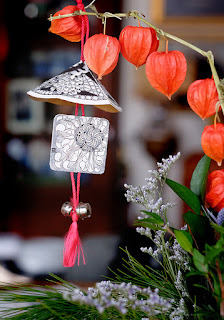 And hang it for your special person to DISCOVER something unexpected . . . from you. Winning commenters chosen randomly from yesterday's blog, On the fourth day of Christmas , Bijou bestowed on me. . . Please send us your snail mail address to zentangle(at)gmail(dot)com so Bijou can send you a little something! On the fourth day of Christmas, Bijou bestowed on me . . .
. . . a "what-knot" for my Christmas tree. This is a somewhat odd Bijouism. N'est-ce pas? What does this mean, "Choose your tangles"? Well, this is where we really get to be creative in our Zentangle endeavors. Other than when you are joining a challenge, as some of us joyfully do . 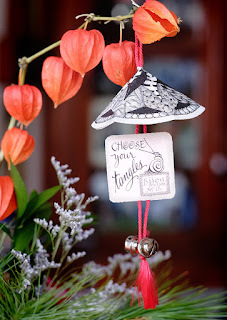 . . when it comes to choosing which tangle to draw, you get to choose! Choose a new one, pick one at random, draw the same one(s) over and over, or change a familiar tangle – tweak it, adjust it, modify it – alter, change, adapt, refine, aura, or perf-orate it! You get to decide. No one to whine about your choice, give you grief about it, tell your mother about it, or tell you that you should have chosen something else! So, it's a little thing, but it belongs to you. Only you. Not many things in this world where we can choose whatever we want, with no uncomfortable consequences to worry about. We say, bravo Bijou! You have shared with us this (albeit tiny) power. A superhero. Yup, that's Bijou. 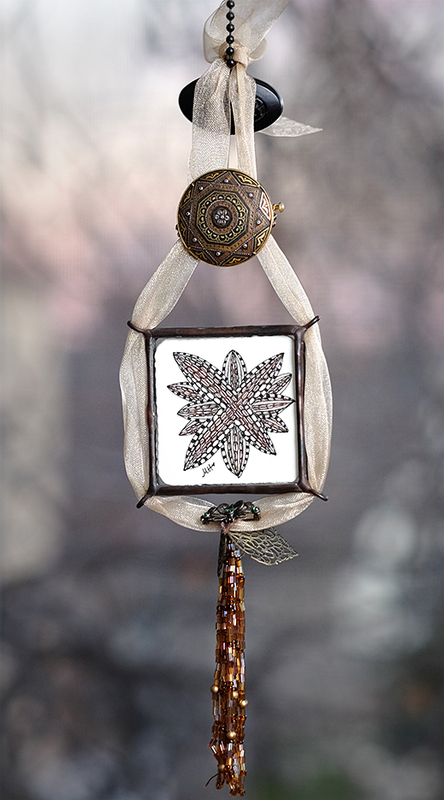 Molly created this ornament from a Zendala, a Bijou tile, and a Bijouism for your pleasure. When you finish tangling your Zendala, fold it in half in one direction, open it and fold it in half the other direction . 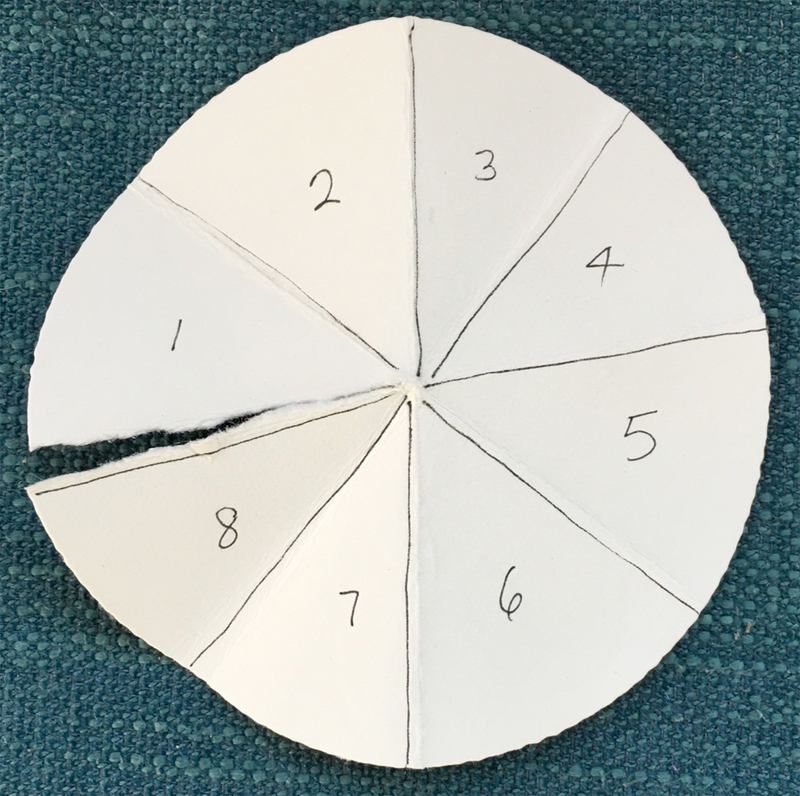 . . keep doing that until you have a "pizza" looking tile with 8 "slices." Make a cut on one slice just to the middle. Glue or tape "pizza slice" #1 on top of "slice" #7 and voila! A hat-like something you (or your cat) might wear at the beach! Please send us your snail mail address to Zentangle [at] gmail [dot] com. Many thanks for your participation in our Zentangle Journey! 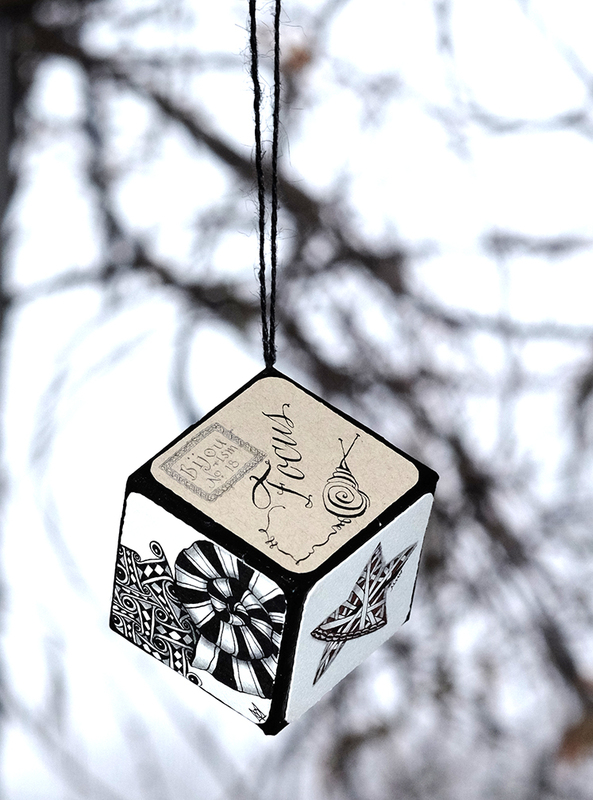 On the third day of Christmas, Bijou sent to me . . .
. . . a trinket for my Christmas tree. This so very important Bijouism is one we should all consider – especially at this time of year. We seem to have less forgiveness for our own missteps. As simple as it sounds, it can be a difficult thing to master. It takes practice. 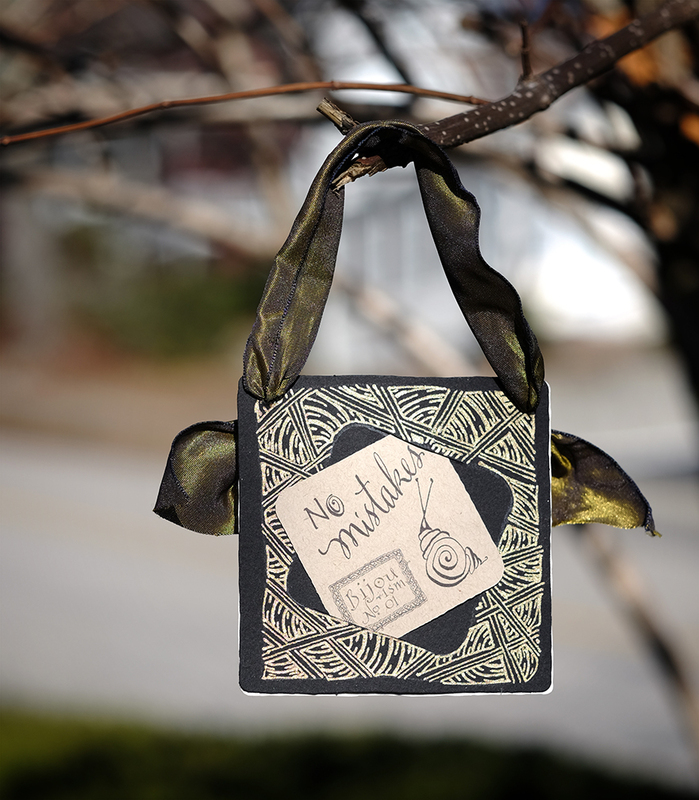 So maybe start with a Zentangle tile. A Bijou tile. Only teeny, tiny faux pas (as Bijou might say) to start with. Imagine looking at your Zentangle art, as if it were a child's. Think of only the good parts of it and focus (again with the focus) on those parts. Guide yourself on a path of discovery, find a way to make it a jewel. 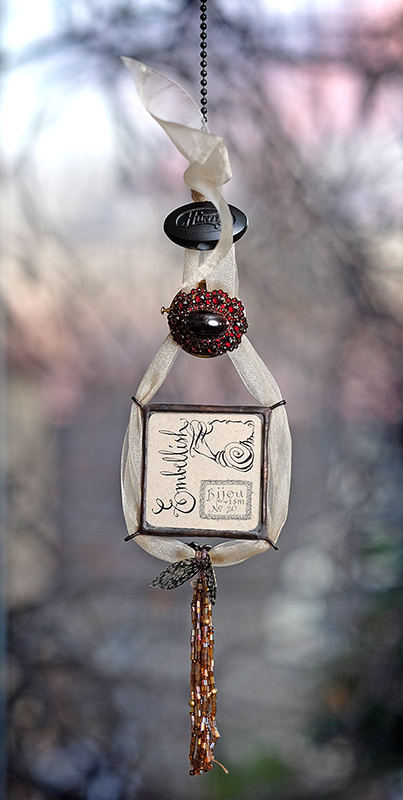 Like it or not, this Bijouism will follow you into your daily life. There are no mistakes in life. Oh, we hear the reply, "Of course there are mistakes!" But, until the story is finished, who can say for certain that any event will prove to be a mistake at the story's end? At a minimum it is an opportunity to be more gentle with yourself. Then you have a chance to learn something new, an opportunity to do something unplanned, a way to save the day that perhaps you may not have given yourself a chance to consider. So, have fun with this. It is a gift . . . from Bijou. This has to be the "Bijou-i-est" Bijouism, for sure! Bijou is the symbol of "slow down," with the turtle a not-so-close second. This simple and amazing creature gets done whatever it needs to get done in its own time. So, what does Bijou teach us? Get things done in your own time. We are all tempted to drive, walk, talk a bit faster when we are under pressure. We are bombarded with the speed of life. 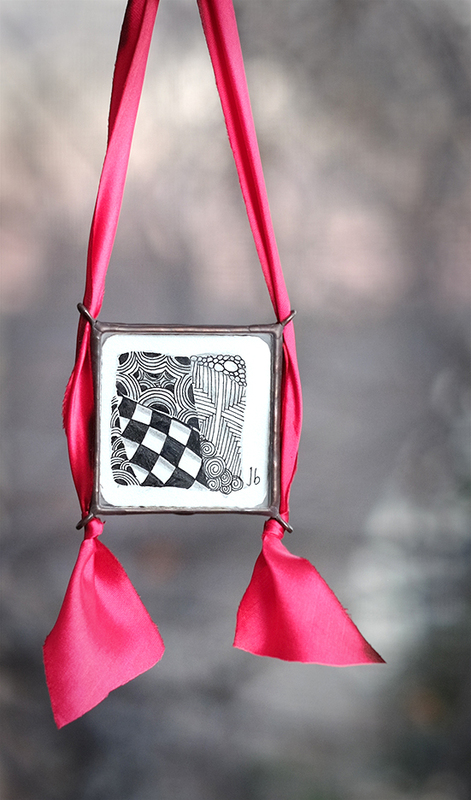 So, let's start our journey with a Zentangle tile and enjoy all its rewards. Our strokes will be what we want. Maybe we take our time to embellish a tangle before moving on to the next. We may decide to follow a more interesting, challenging (instead of safe) path as we move through our tile, our life. All good things which seem just out of reach when we rush. 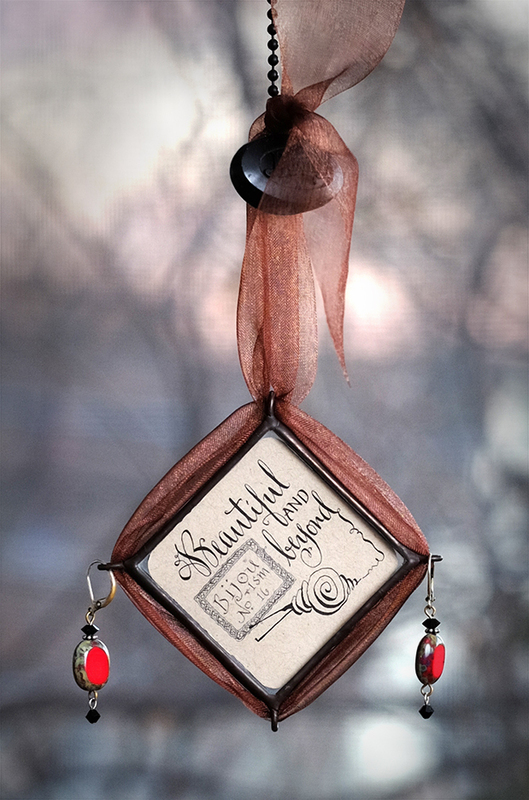 This "trinket" was created by Julie. With a pencil, she traced the outline of a Bijou tile on a 3.5" tile, drew a larger border around that tracing, and tangled within that frame. After she finished tangling, she cut two slits on opposite sides of the original Bijou tracing and inserted the Bijouism. Once both tiles were done, she double side taped the two together back to back and punched two holes in the top corners and topped it all off with a very lovely ribbon. 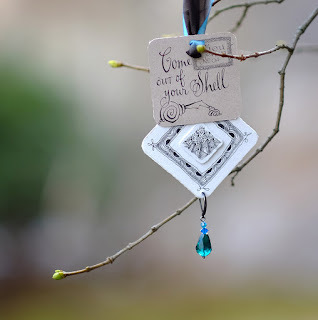 So simple and a very lovely trinket for any time of year! Please send your snail mail address to Zentangle [at] gmail [dot] com and we will send along some treats! Rick, Maria, Molly, Bijou . . . and Julie! On the second day of Christmas, Bijou gifted me . . .
. . . some baubles for my Christmas tree. verb: To taste and enjoy completely. How often do we take the time to savor anything? – to really savor? There are so many little things that deserve this attention. With Zentangle art it is especially important to take the time, in the moment to "taste" and enjoy this treat. To savor your tile (to me anyway) means going beyond just the casual acknowledgement of creating. ​It begs us to admit to being an artist – to take pleasure in accepting someone's compliments of our art. It means saying, "Thank you," instead of listing the things that went wrong or could have been better. It means basking in the glory of the moment. As an artist, one needs to create, savor, then move on to the next project. With Zentangle art, this is so possible just because of the simple fact of the small size of the "canvasses" used. Delight in the easy journey from start to finish; in the use of great tools; in the feeling you have when you are done. Exhibit your Zentangle art, save it, or frame it and give it away. There's always another tile waiting to be created. verb: To make (something) more attractive or interesting by the addition of decorative details or features. To embellish or not to embellish, that is the question. To me, adding those little details and tangles is just plain fun. Once in a blue moon, a tile begs to be simple. But I find such pleasure in adding a few auras or perfs around the perimeter of a tangle. Like adding lace around a collar or etching patterns in a suit of armor, the act of embellishing has been around forever. It feels good to add your "marks" to your creations; even if your creation is a pattern in itself. I absolutely love to add patterns within my tangles: stripes, knightsbridge, circles . . . it is what Zentangle art is all about. Never fear. Embellish to your heart's content! This just says it all. The beauty of Zentangle art is that it is what it is. You don't have to compare it to anything else. It doesn't have to look like anything else. It can be as big or as small as you like it to be. It is an emotional statement. It has Heart. These 3 ornaments that Molly has put together for us are a mixture of Bijou tiles, Bijou frames, snippets of ribbon, and old orphan or seldom used pieces of jewelry – charms from childhood, old rings that no longer fit, earrings that no longer have a mate. 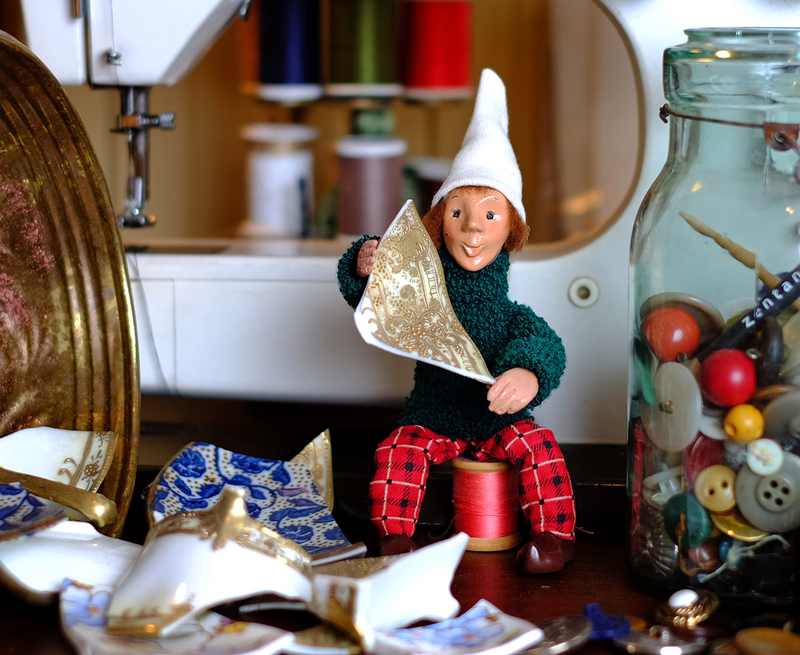 Temporarily attach them or sew them on – no harm comes to any of the "baubles" in the making of these ornaments. 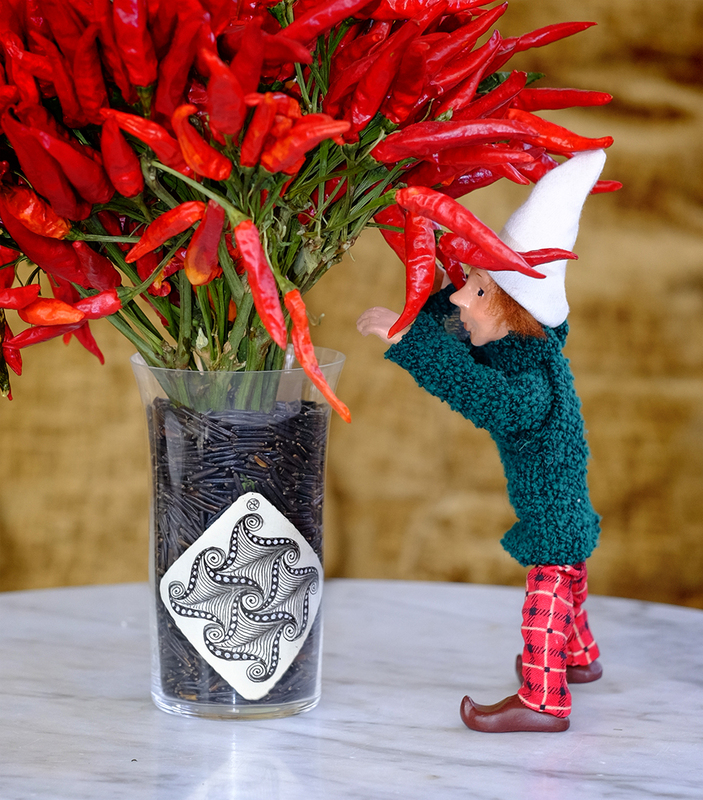 We hope you are enjoying our series paying homage to Bijou and his Bijouisms. Stay tuned tomorrow for more fun ways to illuminate and display Bijou tiles at this festive time of year. See our website for more information on Bijou tiles and frames (limited frames available). We will again send out a Bijou gift to a few lucky tanglers who have written one of these great comments on today's blog. 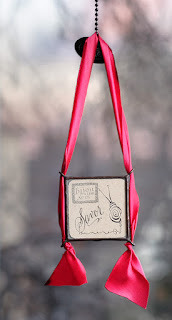 Winners please send us your snail mail address to zentangle@gmail.com to receive your gifts. 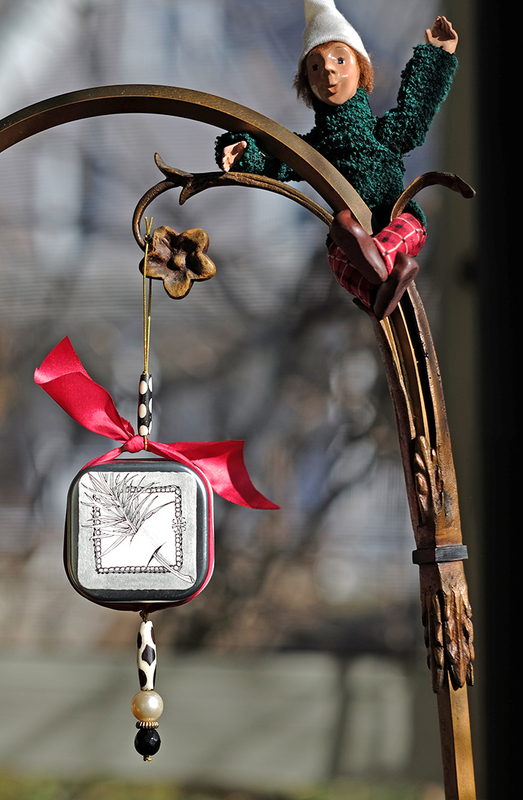 On the first day of Christmas, Bijou gave to me . . .
. . . an ornament for my Christmas tree. verb: to regard with wonder, pleasure, or approval. Ahhh. One of the best parts about creating Zentangle art is taking the time to admire and appreciate our own work. Bijou even suggests doing this while you are tangling your tile as well as when you finish. So, enjoy your work as it evolves and then, sit back and admire it again when you feel it is done. Stretch your arm out with tile in hand, turning it this way and that to view it at different perspectives. See how your strokes come together to create something you had not imagined – something new and amazing. And don't forget to admire others' works, taking the time to point out the parts you particularly like. "Just how did you do that version of hollibaugh?" It is so fun to see other artists' eyes light up when you admire their art. What an easy gift to give someone! In the rush of a busy day, it's easy to forget to take a moment to admire something . . . particularly something you created. Bijou reminds us not to forget this important part of life. "Focus" is both an action and a result of practicing the Zentangle Method. 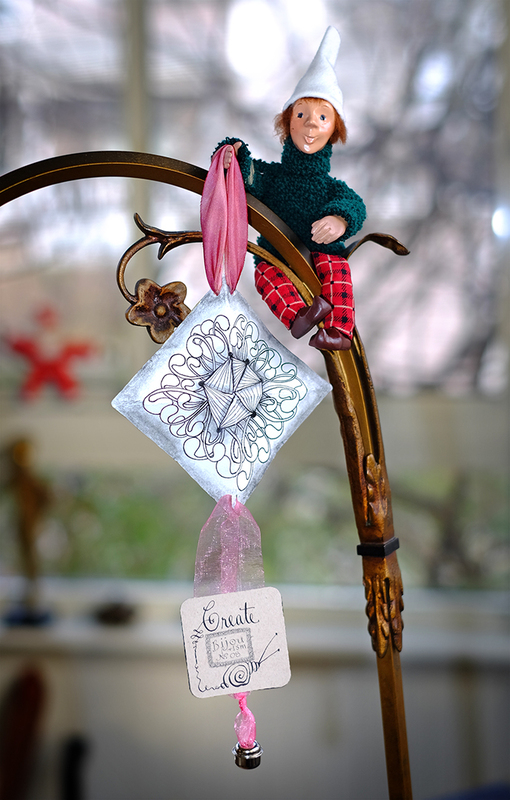 Bijou reminds us how creating Zentangle art and focus go hand-in-hand. Setting aside even a little time for your Zentangle practice will allow more focus into your life. All the chaos going on in your head seems to fade into the background. Zentangle does not make the chaos go away, but it does give you a chance to take a rest from it. And, it gives you the focus that helps you to work through it. 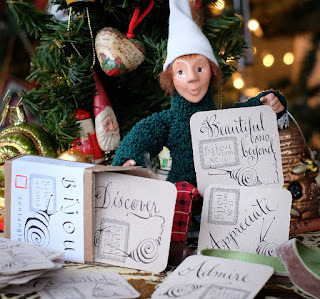 Learn more about Bijou, our dear friend and adviser, at zentangle.com/bijou. Molly created this cool ornament by assembling six 2" squares of chipboard into a cube. She attached a string to hang it and then covered it with black duct tape. 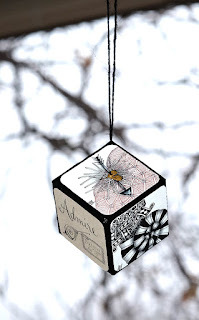 Using double-sided tape, she then attached four completed Bijou tiles and two Bijouisms to the cube. Et voila . 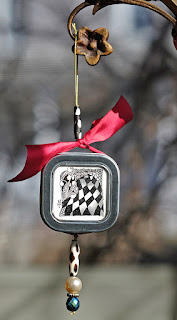 . . an ornament for your tree, window, chandelier, or wherever your heart desires . . . to be an admired object of focus throughout the coming year(s)! What a nice time of year to take some time to have another look at some of the wonderful "zentiments" and philosophies that our friend Bijou has brought to light in what we call Bijouisms. Join us for these 12 days as we look at some of them, get re-inspired and create something fun with them. We will randomly choose one name from our list of commenters to send a bunch of Bijou stuff to have your way with! Join us tomorrow for Day 2! Rick, Maria, Molly, et Bijou!